In an interview on Sunday, Premier Gordon Campbell said he will stick to his game plan for a referendum: “a clear, clean unequivocal question” in September of 2011, to be decided by a simple majority of voters. The populist uprising to scrap the controversial harmonized sales tax has already rung up a string of victories, including a successful petition effort to force a reconsideration of the tax, and the pledge from Mr. Campbell last week that he will abide by a majority vote. That promise was widely seen to seize the political initiative from the anti-HST forces, forcing petition organizers to argue against a full-blown referendum next year. The Fight HST campaign is aiming to go back on the offensive. In a Monday morning press conference, former B.C. premier Bill Vander Zalm is to roll out the list of Liberal MLAs who could become targets of a recall campaign as early as this November. Under B.C.’s recall legislation, an MLA can be forced out of office, and a by-election triggered, if 40 per cent of voters in a riding sign a recall petition. The possibility of a recall effort that would pick off Liberal MLAs has been an explicit goal of the Fight HST campaign for months. 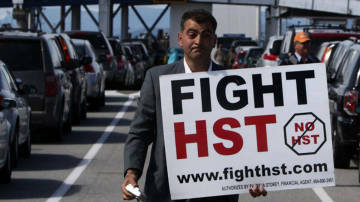 However, anti-HST organizers say they will outline conditions Monday under which a recall campaign could be shelved. “We’ll provide some options,” said senior organizer Chris Delaney. and dispelling confusion over the rules governing the referendum by introducing amendments to the Recall and Initiative Act, or else hold the vote under the Referendum Act. “It has to be done under a legislative framework that everyone understands, not the Premier’s word,” Mr. Tieleman said. In his comments to The Globe on Sunday, Mr. Campbell rejected all those demands, saying his aim is to have a fair vote on the future of the HST. He declined to say what the referendum wording would be, saying it would need to be discussed with Elections BC. The act sets a high threshold for success for a vote, a majority of registered voters in the province, and separately, in two-thirds of the province’s ridings. Even if successful, the vote is not binding on the government. However, last week, Mr. Campbell said he would abide by a simple majority of votes cast, a much lower threshold than specified in the legislation. The Premier said he sees no conflict between that promise and his vow to stick to the letter of the recall law, since the requirements of the legislation will still be met. The Premier said he is simply outlining the steps he will take after the vote. Businesses, including real estate developers, have complained about the uncertainty created by a 52-week delay in deciding the fate of the HST. In response to those concerns, Mr. Campbell said the HST will be in force until at least the end of 2011, whatever the outcome of the vote next September.